The GreenWorks 3-in-1 electric Mower is one of our top choices for best corded electric lawn mower. This mower offers several features that are extremely helpful for most people, like 7 cutting heights, 3-in-1 capabilities, easy maneuverability, and compact folding storage. 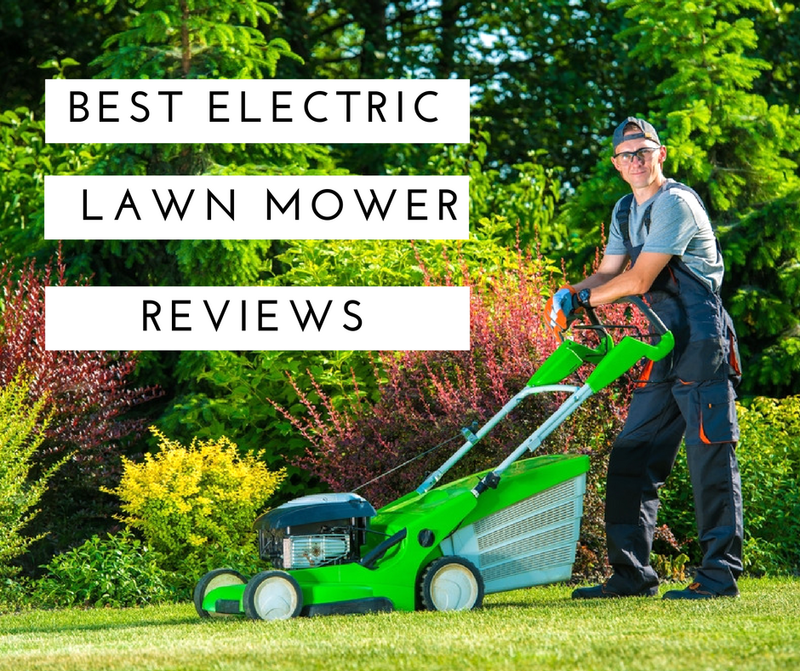 For other fantastic electric mower recommendations, be sure to read on to make the most informed decision for your lawn. Is a Corded Electric Lawn Mower the Right Type of Mower for You? Corded electric push lawn mowers are a popular choice for lawn mowers because they offer several benefits over gas mowers. Some lawns just aren’t large enough to warrant the need for a ride-on mower, so corded mowers can be an excellent, affordable option between a ride-on lawn mower and a gas-powered push mower. Cordless electric mowers tend to be popular for their ability to mow using a battery, rather than being limited by a cord. However, corded electric lawn mowers are only restricted by the availablity of the length of their cords or extension cords. Cordless mowers, in contrast, can only run for as long as their batteries allow, and some batteries need a full day to recharge. Corded electric lawn mowers are a good option for people with mid-size lawns with thick grass. Cordless electric lawn mower models have to use more power or volts to cut through tough grass, which lowers their battery’s run time. Corded electric lawn mowers are connected by a cord the whole time, so they have the capability to use the power they need without running out of run time. Corded mowers are also better for your overall health and the environment than gas-powered mowers. Corded mowers are much quieter than gas-powered mowers, so they’ll give your ears a break. And, according to National Geographic, gas-powered mowers running for an hour create as much fuel emissions as a car running for four hours. Corded mowers release no emissions, which means they leave no carbon footprint. Deck size. Most corded mowers at best range between 14″ and 20″ cutting decks, which relate to the width of the area that they’ll cut at one time (source). For larger lawns, consider a larger cutting deck to save you time. Cord length. Different mower models will have different cord lengths. Consider the size of your lawn, and plan on buying an extension cord, if necessary. Other abilities. Some corded electric lawn mowers will come with mulching and bagging capabilities. These models are often labeled as “3-in-1” lawn mowers, because they can side discharge, bag, and mulch the grass. Wheel types. Some mowers come with plastic wheels, and others come with rubber. Rubber can handle more terrain than plastic. Additionally, larger wheels can typically maneuver through your yard easier than smaller wheels. Corded mowers work in much the same way as a traditional gas-powered push mower. They are walk-behind mowers that take some amount of physical effort to push through your lawn and guide in a specific direction. There are a few important things to remember when operating a corded lawn mower for your safety. First, always wear protective clothing, such as eye goggles, long-sleeve shirts, long pants, and heavy-duty boots. You may also want to use gripping gloves to help you keep a firm control of the mower. Additionally, corded electric lawn mowers need a little more observation while operating than cordless electric lawn mowers because of their cords. The cord can prove to be a hazard if you’re not careful about keeping a close eye on it while you mow. According to Do It Yourself, the safest way to mow with a corded electric lawn mower is to keep an eye on the location of your power cord at all times, and mow away from it, rather than toward it or parallel to it. If not, you risk tripping over the cord, or running over the cord with your mower. This not only can damage your blades, but it’s also an extremely dangerous electrical concern. For other specific safety instructions about your model, always check your owner’s manual before you begin using it for the first time. Like other lawn mowers, your corded electric lawn mower can stay in top shape if you are diligent in taking care of it properly. Any type of lawn mower can benefit from a routine maintenance and inspection schedule to keep everything working optimally. First, start by cleaning your corded electric lawn mower after each use. Make sure your mower is turned off and unplugged. Then, turn it over to wipe down the blades and the cutting deck to prevent any buildup from grass or debris. Use a brush or soft cloth to also wipe down the vents. While you have your mower in this position, it’s a good idea to check all fasteners and bolts on the machine. Make sure they’re tightened fully and aren’t rusting. If they are, get replacements before using the lawn mower again. According to Ever Unfolding, you should also check your power cord reel before you use your mower. Make sure that no part of the cord is frayed or damaged, which poses an electrical hazard. Insulation tape can be used for minor repairs, but for anything major, check with your manufacturer about getting a replacement. For many types and sizes of lawns, the GreenWorks 3-in-1 Electric Mower is an excellent choice for best corded electric lawn mower. GreenWorks provides similar models in different cutting deck sizes, so you’re likely to find one that will work best for your needs. This particular model will be a breeze for most people to maneuver around their yards. The rear wheels are larger than the front, which can help give this corded electric lawn mower more traction, while also allowing it to steer easily with your guidance. If you’re looking to get the most out of your corded lawn mower, another reason to consider this model is its 3-in-1 capabilities. Mulching your grass with this mower can encourage new growth in your lawn, while also strengthening the overall health of your grass. If you don’t feel that mulching is necessary, you can bag your clippings to save you the hassle of raking after you mow. To keep this mower working its best for years to come, regularly inspect the blades, cord, and wheels for any signs of damage. Thoroughly clean the mower before folding it up for compact storage.